This Chainless is so effortless in its design that most people do not notice right away that it has a shaft instead of a chain. But once you do start to appreciate that dynamic design feature, another conundrum hits your brain. 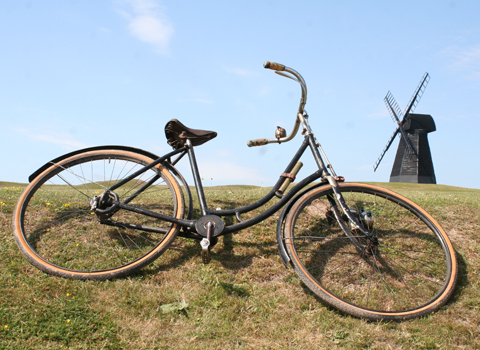 For it starts to dawn on you how amazing a machine this is, being a bicycle made in 1898 …112 years ago. A woman is as much entitled to the best bicycle as is a man. 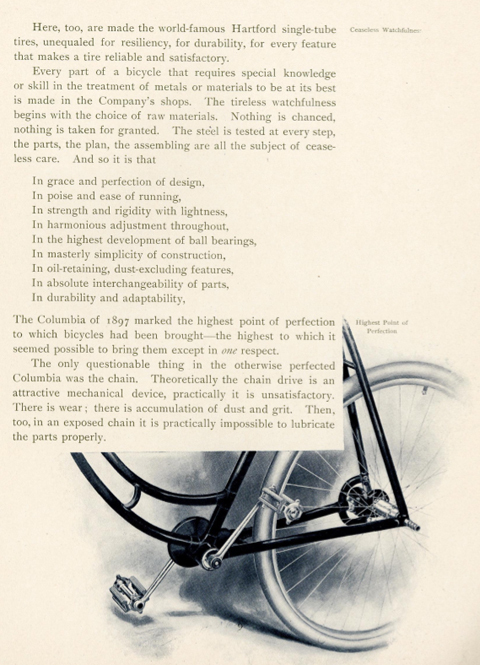 COLUMBIA bevel gear chainless bicycles are built upon lines which contribute to the graceful appearance of the rider. 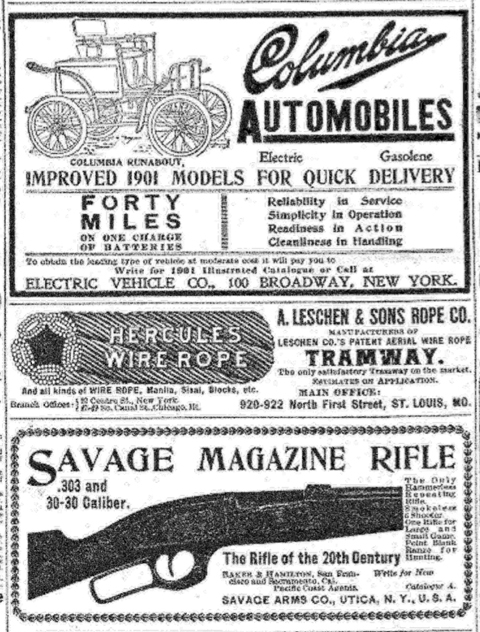 The bicycle, followed a decade later by the motorcycle and the car, were prime candidates for such promotion. 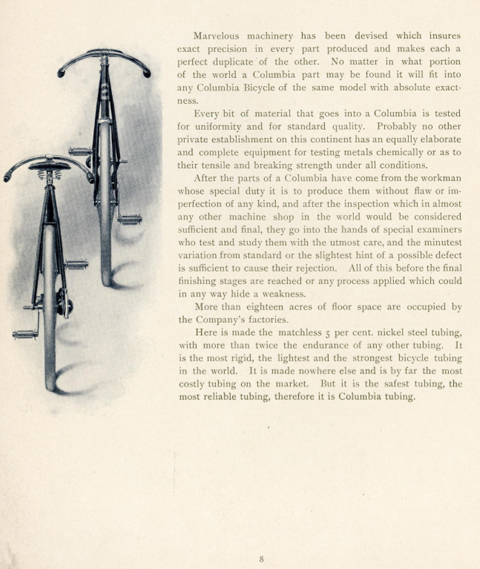 Bicycle ads used a competitive element, as well as other new ideas, such as celebrity endorsement and sponsoring racing teams. 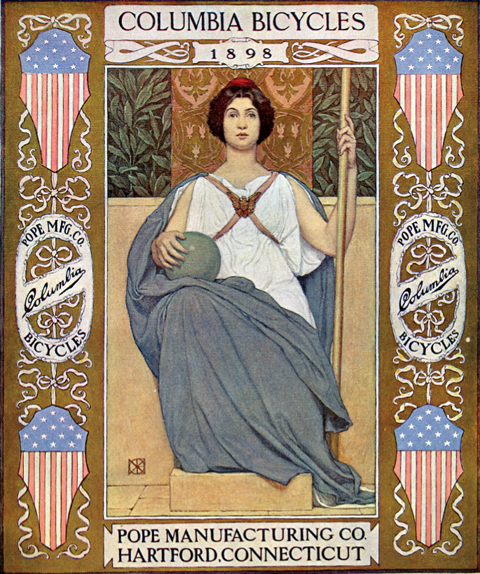 Bicycle advertising also helped boost a new mass media: the magazine. Most of the Pope ads on this page are taken from magazines of the period. 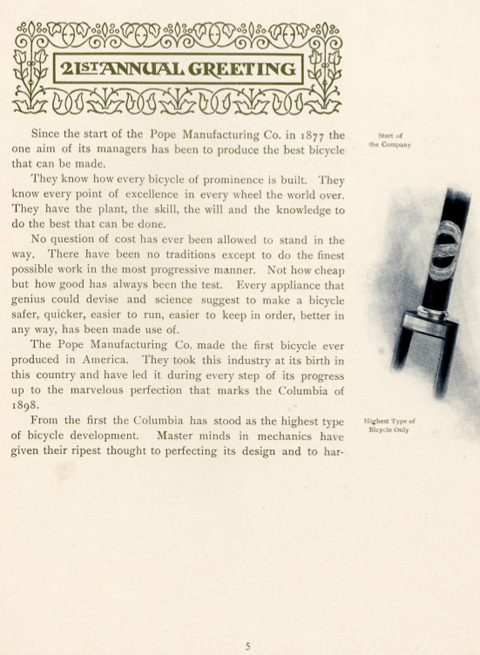 Having bought out or merged with most of their main competitors, Pope Mfg Co was now America’s number one cycle manufacturer. With their advertising budget providing both financial and creative stimulus, ads for Pope bicycles were among the best of the era. The horses in the field behind the Columbia made a great backdrop for my photoshoot. 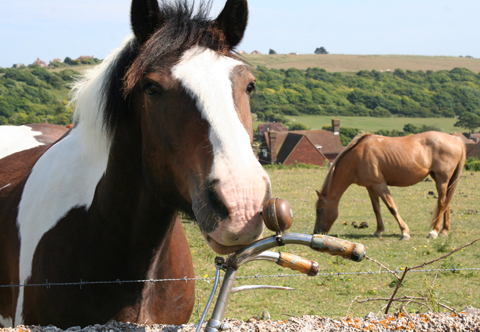 However, one of them – I was later told his name is Ronnie, and he’s five years old – was particularly curious about the bike …and started eating it. Its patent dates are 10th Oct 1899, 12th Dec 1899 and 27th Nov 1900. The red and green side jewels illuminate when lit. 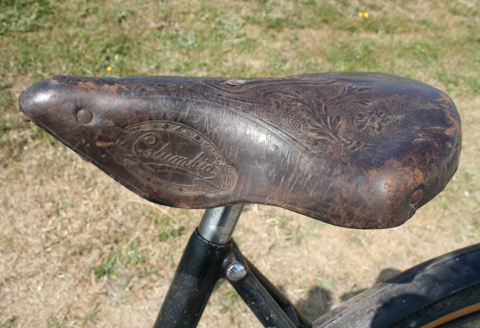 As you can see, this ornate saddle from around the turn of the century is made by Columbia. I found it at an auction. 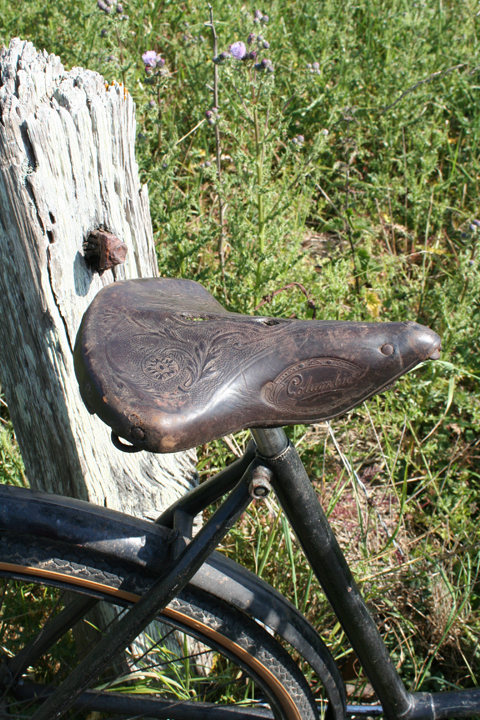 I had to buy a box with ten other saddles in order to get it, and they were very expensive. At the time I thought I’d sell the rest to get my money back, but I’ve become quite attached to them. 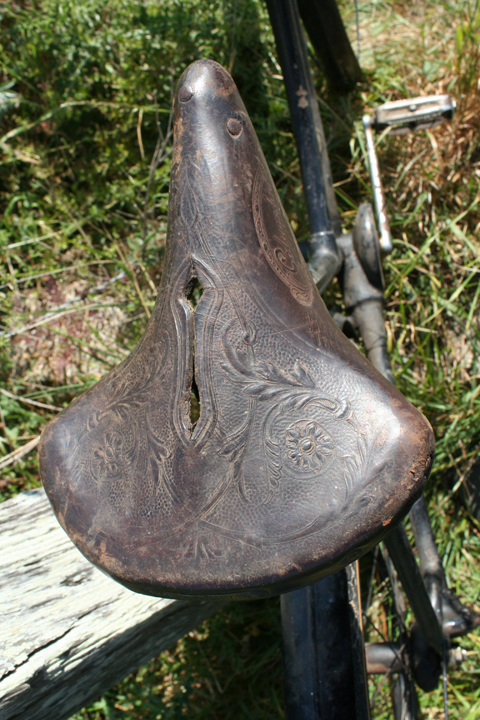 Leather saddles are an essential part of our attraction to vintage vehicles. The olfactory glands are next to our memory, and there’s undoubtedly an unconscious ‘memory’ regarding the smell and patina of leather. 1843 – Albert Pope’s date of birth, May 23rd. He ended up becoming a Captain in the Civil War. Came out of the Civil War looking for a job. Later he was referred to as Col. Pope. 1876 – Pope attended the Centennial Exposition where he saw a two wheeled contraption. When he came back he researched and went to Europe. 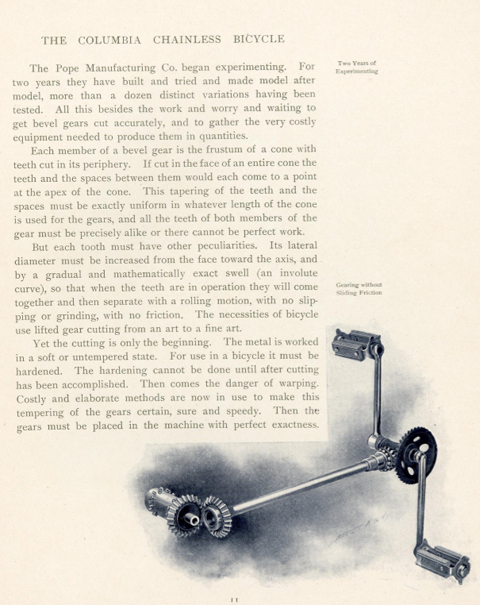 1877 – The Pope Manufacturing Company was organized. First small beginnings in the bicycle business as importers and makers at 45 High St. Boston, Ma. His first wheel cost $313.00 and the factory was not equipped for mass production. He began looking for a vendor. 1878 – Larger salesrooms and a Bicycle Riding School at 87 Summer St. Boston, Ma. 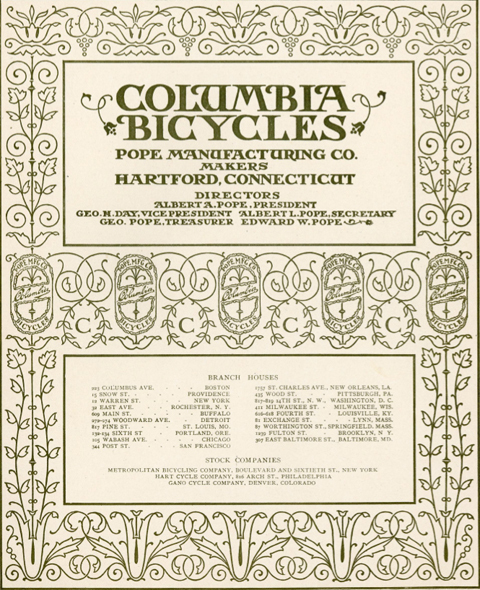 The first American manufacturer of cycles begun with the Columbia Bicycle at the Weed Sewing Machine Company factory in Hartford, Ct. The first regular trade catalogue was twenty pages long. 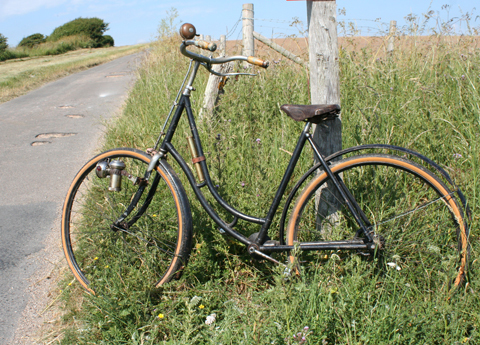 The first bicycles were the 60″ Hi Wheelers and sold for $125.00 when sewing machines sold for $13.00. 1879 – Agency systems and a uniform pricing system was established. 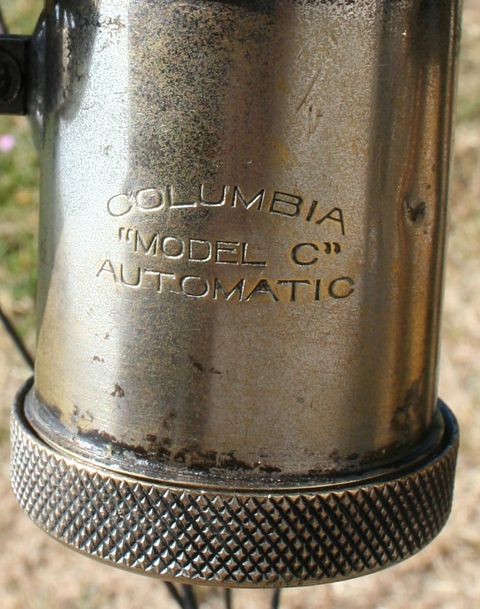 The model was the “Standard Columbia”. 1880 – Model’s “Special Columbia”, “Youth’s Columbia”, “Mustang”, and “Youth’s Mustang”. The “Columbia Ball Bearing” was introduced. Started the Wheeling Association to fight for better road and cycling clubs. Still around today. 1881 – Larger quarters at 597 Washington St. Boston, Ma. The Columbia Warrant or Guarantee was instituted. 1882 – A Branch House in New York was established. 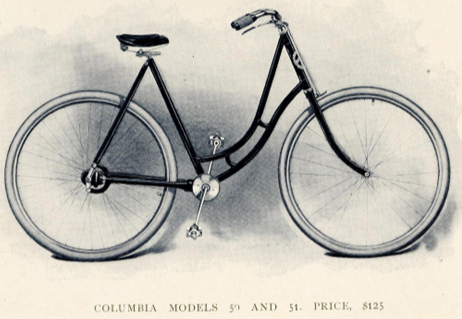 Model “Expert Columbia” was the first bicycle ridden across the U.S., from Oakland, Ca. to Boston, Ma. – 103 days, 3,700 miles. Then went around the world. “Columbia Enamel” was introduced. 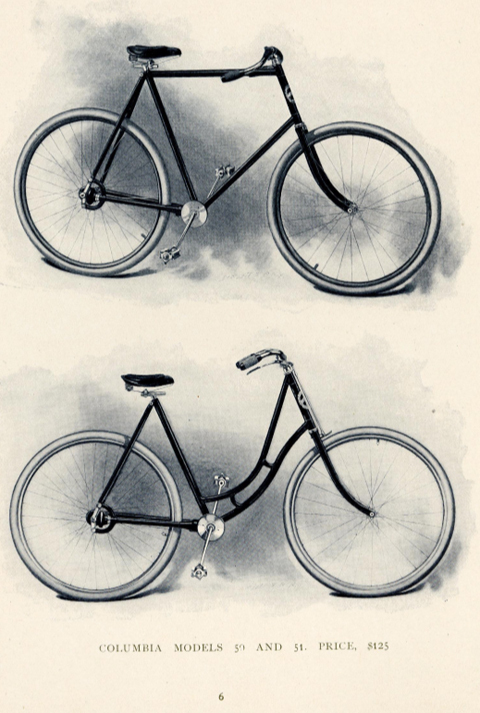 1883 – Model’s “Columbia Racer” and “Three-track Tricycle”. 1884 – A Branch House in Chicago was established. 1885 – Model’s “Columbia Light Roadster” bicycle and “Two-track Tricycle”. 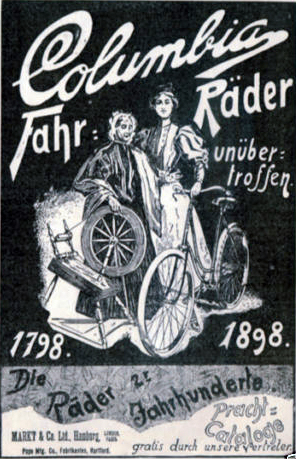 1886 – Model’s “Columbia Safety” (front drive), “Semi-roadster” bicycle, and “Ladies Two-track Tricycle”. Records of one mile in 2:29 4/5 seconds and 22 miles in the hour were made on a “Columbia Racer” and stood as World’s Records for years to come. 1887 – The building at 77 and 79 Franklin St. Boston, Ma. was occupied in January. Model’s “Columbia Tandem”, “Columbia Racing”, and “Light Roadster Tricycles”. 1888 – Model’s “Veloce Columbia” (rear drive Safety), “Volunteer Columbia”, and “Surprise Columbia Tricycle”. 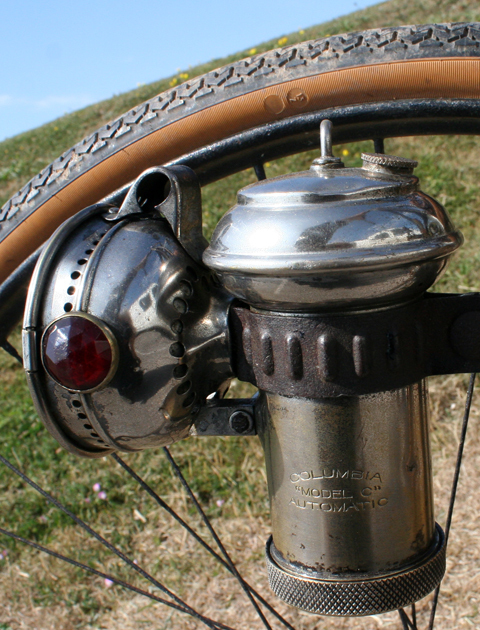 1889 – Model’s “Columbia Light Roadster” and “Tandem Safeties”. 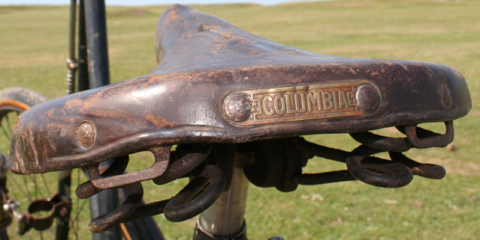 1890 – Model’s “Columbia Ladies Safety” and “Racing Safety”. 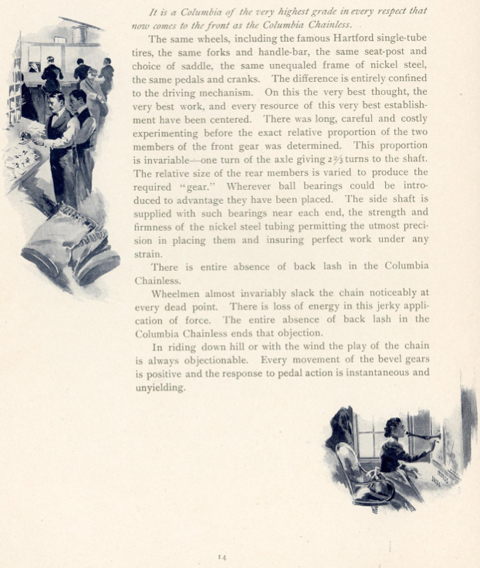 Columbia “Cushion Tires” were introduced. Final control and absorption of the Weed Sewing Machine Company took place. Stock went from $5.80 to $75.50. Colonel Pope bought the company for $15.60 and started the Pope Manufacturing Company. “Father of Good Roads” awarded. Instrumental of Congress awarding $10,000 needed for good road construction. M.I.T. started four courses in road engineering. 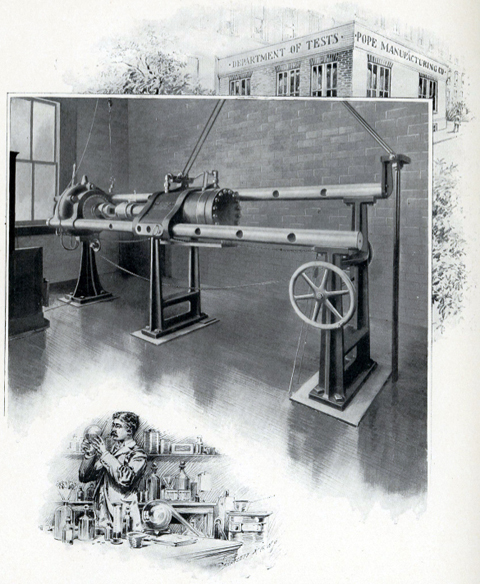 1891 – Model’s “Columbia Light Roadster Safety” and “Pneumatic Racing Safety”.Great enlargement of the factory. Erection of a new building for the headquarters at 221 Columbus Ave. Boston, Ma. 1892 – Model #30 (Relay). Century Columbia. Columbia Pneumatic Tire. Started a big growth period. 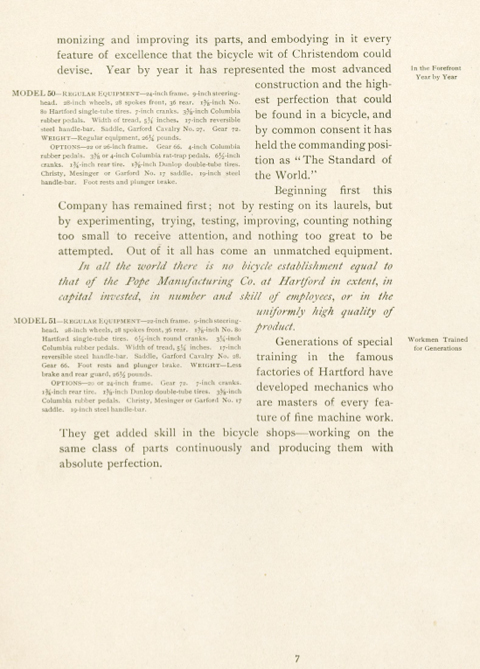 Purchase and enlargement of Hartford Rubber Works, a steel company, the largest nickel plating factory in the world, tube mills, motor carriage factory (auto), bicycle factory – over 1 million per year sold – $200.00 ea. sold in every civilized country of the world. “Trotting” transformed by the application of Columbia Pneumatic Tires and Ball Bearings. 1893 – Model’s #31, 32, 33. Columbia’s Pneumatic Tires were first successfully applied to road carriages. The Tube Mill was completed and put into operation. A new East wing was added to the factory. 1894 – Model’s #34, 35, 36, 37, 38, and 39.Erection of a new office building at Hartford, Ct. 1895 – Model’s #40, 41, 42, 43, and 44. Concentration of all interest at Hartford, Ct.Sale of Hartford Cycle Company’s product taken. Started purchasing all competition (over 75 companies) and put them under the “American Bicycle Company” that he owned. Pope put together other companies for the automobile. Built factories, formed “Electric Company”. 1896 – Large additions to Columbia plant. New Tube Mill Completed. Experimental work was done on auto’s. The Mark I Phaeton Electric Car was completed. Hiram Maxim, an engineer, astonished everyone with operating a gasoline carriage (auto) on the streets of Hartford, Ct. Col. Pope purchased all the rights to the car. Beginning of the Westfield Plant: Lozier Manufacturing Company of Cleveland Ohio is building a factory division in Westfield, Ma. Land was donated by the Noble family, 10 acres on Silver St. and $10,000 to cover a shortage in the subscription. Subscription raised $75,000. August 5th, contract signed, company to build Cleveland Bicycles. 1897 – In 1897, the Westfield Plant was completed in less than a year. On February 3rd, it was expected that the factory will be operating by February 15th. New tube mill in operation . Five percent nickel steel tubing a new Columbia feature. A new building was added to the Columbia plant in Hartford, CT. Total floor space, 17 1/100 acres under one roof and extended over a mile along the New York – New Haven – Hartford Railway, employed nearly 10,000 people. Col. Pope produced the “Pope Hartford” and was running from New York to Boston, MA. The Mark III auto was developed. In May, ten vehicles were exhibited, sold for $3,000 each. Gasoline powered Tricycle available. Rental business of Columbia Electric Carriers on a for hire service established. 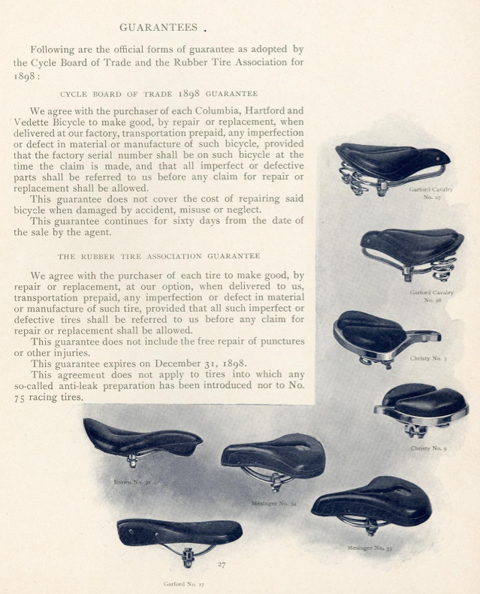 1898 – The GREATEST contribution to cycling and autos! 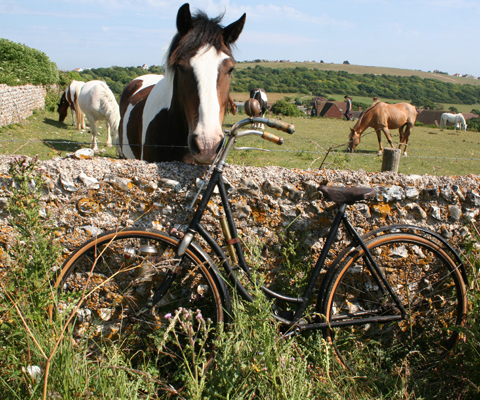 They produced the chain-less bicycle. It was shaft driven with bevel gears (another new patent). Chain was the biggest problem with cycles. Men attempted to break them for sport. Major variations in automobiles could not gain speed with chains. The Mark VIII is available. It is comparable in design to modern cars with regards to the chassis and engine position. 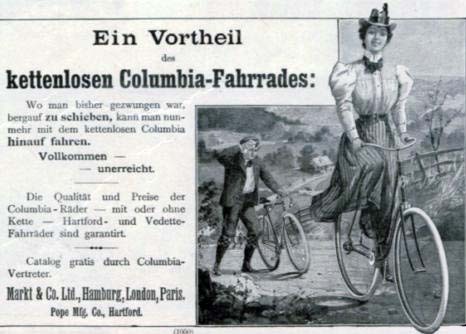 Pope Manufacturing Co heavily promoted their Chainless bicycles, as you can see in the 1901 advertisement above: the rider of the Columbia crests the hill effortlessly, while the poor fellow with a chain-driven cycle has to walk. 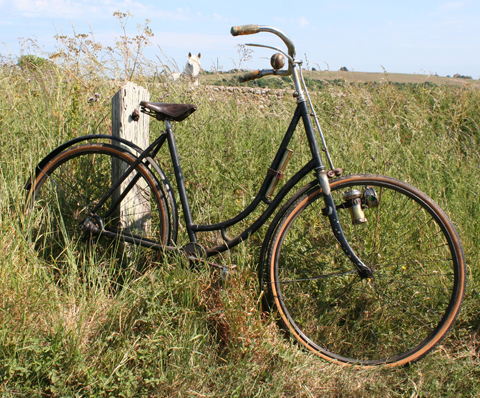 The shaft drive had been available in Europe since the early 1890s, most of the development being carried out by the French company L’Acatane. 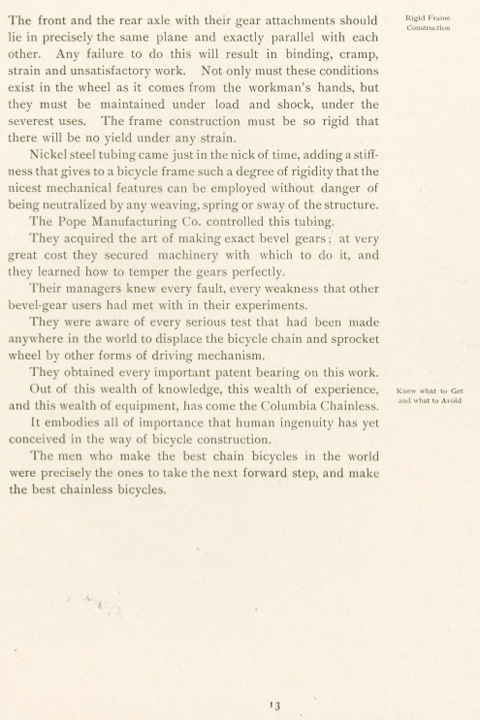 Pope launched their Columbia Chainless in October 1897. It was driven by a shaft connecting two bevelled gears. 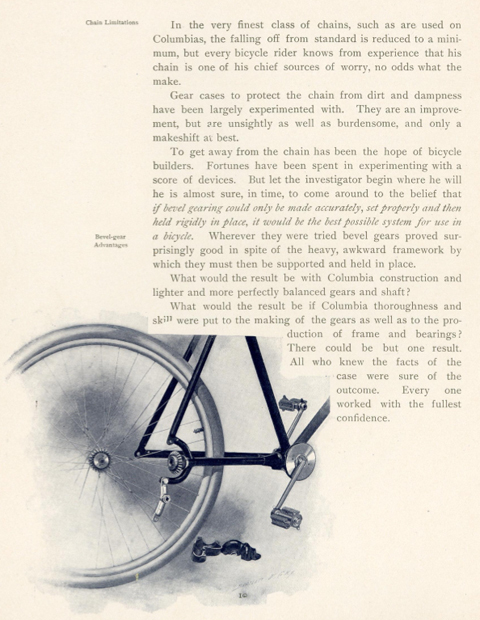 The Chainless was very successful in those early boom years of American cycling, mainly because chain-driven bikes were still, at that time, rough and noisy. 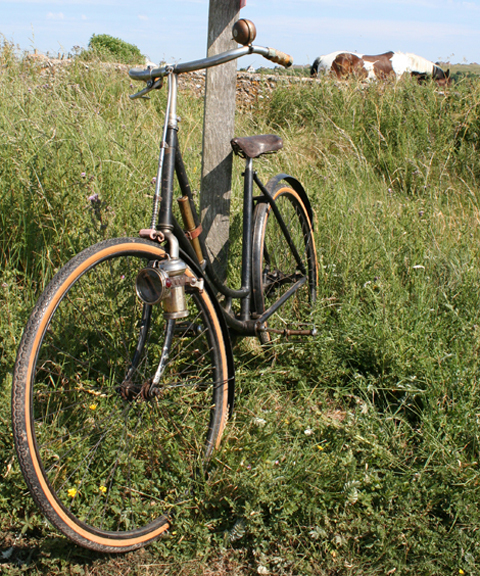 But, by 1900, the design of chains and sprockets had improved sufficiently to relegate the chainless to ‘novelty’ status. SHAFT v CHAIN: Shaft-drive machines did prevent ladies’ skirts getting caught in chains, but the shaft mechanism created considerable friction so wore out more quickly. It was also more expensive. 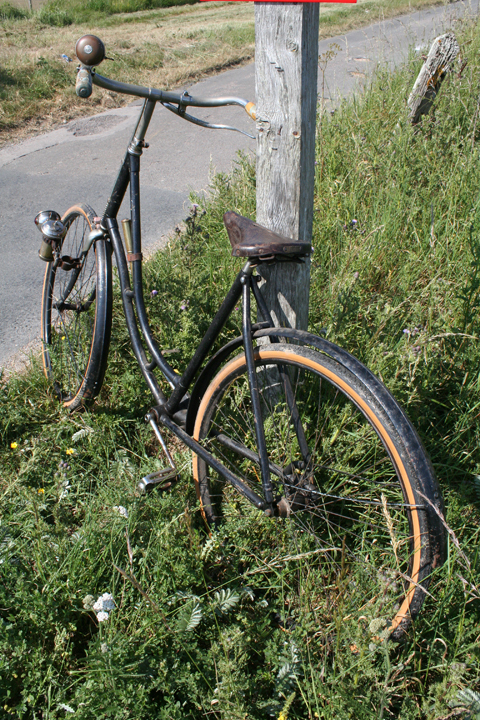 Meanwhile, a chain guard and a skirt guard fitted to a chain-driven bicycle provided the same level of skirt protection at a much cheaper cost. 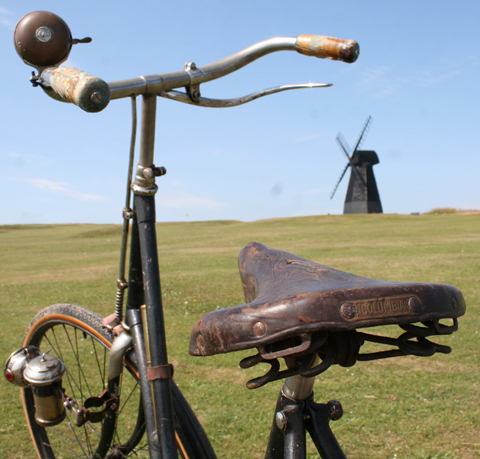 Normal lady’s bicycles were lightweight machines, while a shaft-drive made bicycles heavier. Another disadvantage was that the rear wheel was harder to remove to change a flat tyre. 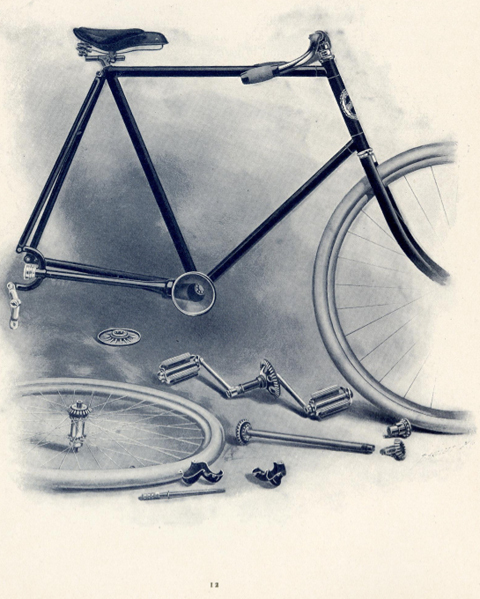 Bicycles of the 1890s were still gearless. 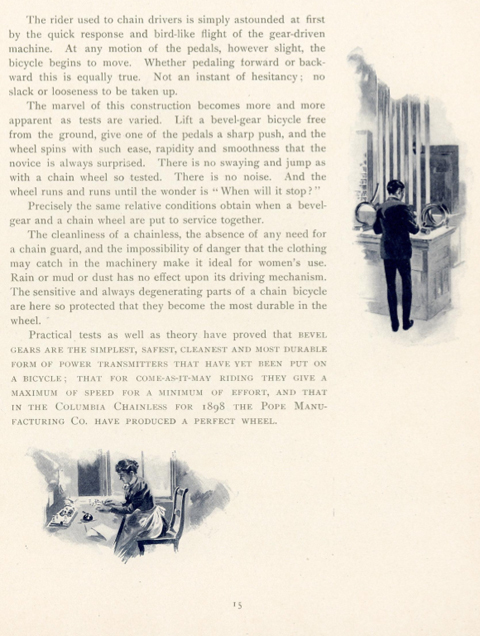 The first hub gears required gear selection while stationary but, by the late 1890s, they had improved sufficiently for gear-changing in motion. 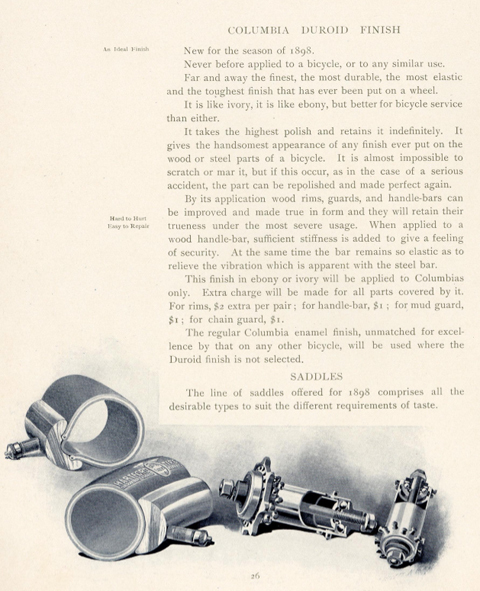 By 1900 gears were generally available and, by 1904, as you can see from the advert below, Pope bicycles were equipped with two-speed gears. 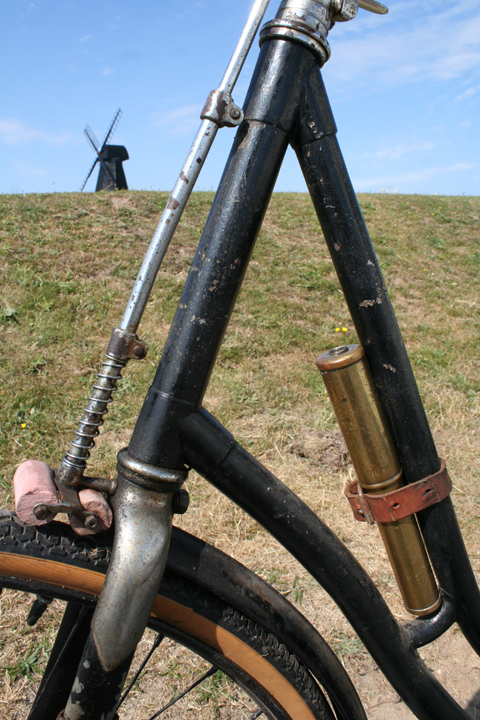 This tyre pump is a saddle pump, made to fit inside a bicycle saddle bag. 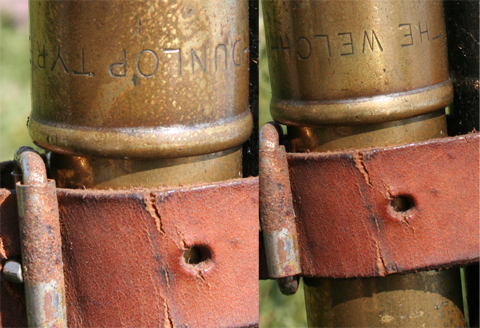 It was made around the turn of the century and, as you can see in the close up pictures below, around the pump it says ‘The Welch-Dunlop Tyre.’ Welch was an inventor who patented the ‘wired-on’ tyre; this is the tyre still used today, rather the previous design known as the beaded-edge or Clincher tyre (which was Bartlett’s patent).